Prime Minister Narendra Modi aims at making India open defecation-free by October 2019. The government’s Swachh Bharat Mission (SBM) brought to forefront many success stories. But there is a flip side to this movement as well. Zafar Hussain, a 44-year-old social worker from Pratapgarh, Rajasthan was killed brutally by local civic officials after he objected to their photographing of his wife and daughter defecating in open, said the press release by Jan Swasthya Abhiyan (JSA) on June 19, 2017. With its head office in Delhi, JSA is a 'People's Health Movement' in the country, which is aimed at establishing health and equitable development through comprehensive primary health care and action on social determinants of health. The Ministry of Drinking Water and Sanitation says that till date 64 per cent of households in rural India use toilet. This means, open defecation is practised by only 36 per cent of rural households. We have fascinating stories from Himachal Pradesh, Sikkim and Kerala, which have given up open defecation completely. There are success stories from different districts also. Several studies on sanitation sector show that motivating communities for building and using toilets have never been easy. Many prefer to go out in the open—a habit extremely difficult to part with. To convince them, Community Led Total Sanitation (CLTS) approach was used. The pioneer of this movement is Kamal Kar, head of a Kolkata-based non-profit CLTS Foundation. He has not only used this approach to bring about behavioural change in different parts of India but also in different African countries. The approaches are non-violent and all about convincing people in a polite manner. 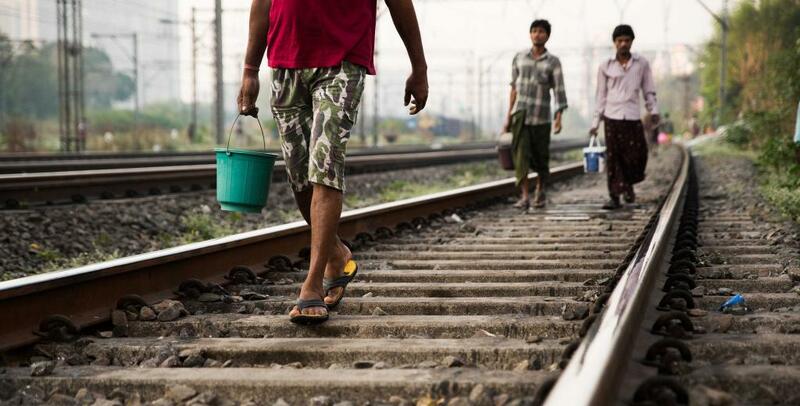 Although there is an element of naming and shaming of offenders (people who practise open defecation), yet the method, which will be adopted, is decided by local communities and the final decision is taken by the individual only. However, due to strict deadline of the SBM, the officials are now trying to coerce communities to stop open defecation and passing stringent laws. Thus, a top-down approach is hurting the basic principle of CLTS movement. Deepak Sanan, former Additional Chief Secretary, Government of Himachal Pradesh and advisor to the CLTS Foundation says that adopting a coercive approach to force people to have toilets may create a division within the community. “Shaming people in public, not marking students’ attendance in school and not allowing villagers to vote in local elections for defecating in the open are not the way to trigger a change in mindset,” adds Arundati Muralidharan of Water Aid, India. This year, there were hoardings in different villages of Madhya Pradesh threatening death penalty to people defecating in open. In 2016, there were reports from Karnal district in Haryana where villagers were forced to pay fine of Rs 500. Every morning, Anganwadi workers, school teachers, health officials and elected panchayat representatives intimidate people defecating in open by blowing whistles and shining torches. These people were mainly poor landless labourers who could not afford toilets, say the media reports. There were also reports from Dhamtari district of Chhattisgarh, one of the cleanest districts of India, where the government officials asked powerful village machineries to punish people if they are practising open defecation. The most commonly used form of punishment is withholding salaries of panchayat secretaries who fail to build toilets in their villages and preventing villagers from using their ration cards if they are not using the toilets. Thus, such desperation to achieve targets for implementation is making people more hostile to safe sanitation. According to Sulakshana Nandi of JSA, the government should have taken an instant action on such incidence which happened in Rajasthan where a person was killed in the name of SBM. Such incidents are happening all around the country, Photography of women defecating in open should be stopped immediately, says Nandi. According to JSA, the government should redesign the process of behavioural change and not hurt the spirit of CLTS movement. The dignity of women has been challenged again and again for not using toilets. Poor maintenance of toilets and unavailability of water have forced many to go out for relieving themselves, says JSA. Not only this, only toilets will not help the women, they need private bathing place. says Odisha-based non-profit Gram Vikas. A report of 2014 said that almost 38 per cent of girls in rural Bihar are forced to change their menstrual cloth or napkin in open and 55 per cent of womenfolk have to take bath outside household premises. Now that the SBM is entering into the last and final phase, the mission should learn from the failures of family planning in mid-70s to avoid any backlash. Communities should not be threatened to practise safe sanitation. Influencing by persuasion and influencing by coercion, both may yield the desired result but the unintended consequences that are attached with the latter must be foreseen. Sanitation has become a prerequisite. The world is watching us and India being a quite familiar name in the global scenario, must keep its standards high as far as health and hygiene are concerned. The Swacch Bharat Mission is gradually nearing its deadline and its time to look back and take cues from the success and failures to meet the targets set under it. But imposing it on people through any means may lead to bitter consequences. A person who defecates in the open should be made aware of the hazards of doing so. A family which doesn't have a toilet in their house have no other option but to defecate in the open, regardless of the use of coercive methods. Infrastructural and financial support must be given for construction of toilets and other private spaces without which the dignity of the female members will remain at stake. Counselling sessions by experts, appointing the youth for spreading awareness, making credit easily available for quick construction of toilets are the alternatives of coercion. It should not be isolated to certain districts and states but should be replicated throughout nation. The nation doesn't need vigilantes. Instead, it requires volunteers who can spread the message of a Clean and Healthy India and help everyone from top-to-bottom to have access to a toilet to do away with the menace of open defecation. Only a healthy nation can realize the vision of New India, as coined by the PM.